Blade construction: Sasaho-shape like a bamboo grass leaf Yari spear, both ridge of Shinogi. Wide in Mihaba, thick in Kasane, gradually becomes wider from base to spearhead. Short round neck Kerakubi. (click HERE for higher resolution image of the entire blade). Forging(Hada): Fine steel is delicately forged in well-ordered Itame-hada and partial small Mokume-hada appears here and there. Sparkling martensite Ji-nie hard metal granules appears along swirl of Itame /Mokume wooden grain mark. Temper(Hamon): Hamon is a rather on stronger side Nie based Suguha with shallow undulating indication. Deep in Nioi mist in the interior where works with frequent short feet of Ashi and temper boundary line generates Hotsure fray indication where long lines of clear Kinsen works. The entire temper gives off sparkling brilliance. Temper of tip(Boshi): Temper of Boshi is sharpened up with delicate Hakikake short lines of Nie. Tang(Nakago): Nakago is in UBU original. Two peg hole. 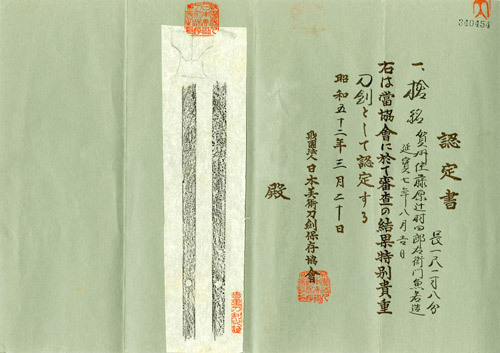 Ō-Sujikai greatly slanting left filemarks with horizontal Kesho marks. The signature inscription starts with the place of work Gashu-ju, name of clan Fujiwara, secular name Tsujimura Shiro'uemon and the name of smith KANEWAKA-zou 賀州住藤原辻村四郎右衛門兼若造. The other side is chiselled the date of year Auspicious day in the 8th month, Kan'ei 7 (1679) 延宝七年八月吉日. The head of sword smiths in Kaga province during Shinto period is widely known as KANEWAKA 兼若 who exclusively worked for daimyo Maeda 前田 family . The founder first smith, Jinroku-KANEWAKA 甚六兼若 was offered the head pisition of the sword makers in Kaga domain by the third head daimyo Maeda Toshitsune 前田利常 and then he moved from Mino to Kaga between 10-11th year of Keicho (1605-1606). He enjoyed Echu-no-kami 越中守 title and changed his smith name to TAKAHIRA 高平 in the 9th month, Gen'na 5 Gen'na (1619). The subject Yari is a work of 3rd gen. KANEWAKA, the 1st legitimated son of the 2nd KANEWAKA. His secular name is Tsujimura Shiro'uemon 辻村四郎右衛門. He actively played ghostmaking for his father during Kanbun era (1661-) by the time he officially succeeded an inheritance of KANEWAKA 兼若 in Enpo 5 (1677). He had taken a great job in the golden age of Samurai in Kaga domain until Shotoku 1 (1711). It is quite uncommon to come across with a Yari spear made to order, adds what is moreover important historical materials of his signature inscriptions in full with the date of year. 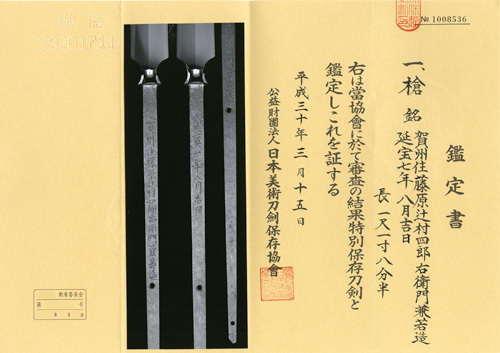 This is understood that this yari in 2 years when he became the head of the KANEWAKA and easily supposed that this was offered to a chief vassal of daimyo Maeda. Preserved in Shirasaya plain wood mounting Sayagaki written by Dr. Honma Kunzan in 1978.